Dr. Denice Denton was the recipient of the 2006 NOGLSTP Educator Award. This award is made to the GLBTA Educator who has enabled significant growth for GLBT students in science or technology – through teaching, counseling, advocacy, role modeling, or other educational roles. Dr. Denton was chosen to receive this award because of her outstanding achievements in engineering and education in addition to her leadership in the GLBT community. Throughout her career in education, she was committed to the ideal of excellence and to its close compatibility with diversity, diverting or creating the necessary resources to make it happen. In May 2004, she was among nine scholars honored by the White House with a Presidential Award for Excellence in Science, Mathematics, and Engineering Mentoring, recognizing her role as a major leader in enhancing diversity in science and engineering. At the same time she was an outstanding role model to the GLBT community by showing that being out at work, including a life-partner in a public manner, and obtaining career success, are not mutually exclusive parameters. At the time of this award, Dr. Denton was Chancellor of the University of California, Santa Cruz. She also held a UCSC appointment as Professor of Electrical Engineering. Previously she was Dean of the College of Engineering and Professor of Electrical Engineering at the University of Washington (UW), the first woman to hold such a position at an NRC-designated Research One university. She has held academic appointments at the University of Massachusetts, the Swiss Federal Institute of Technology in Zürich, and the University of Wisconsin- Madison. 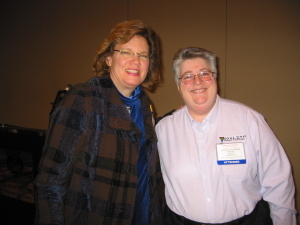 It is with deep sadness that National Organization of Gay and Lesbian Scientists & Technical Professionals (NOGLSTP) acknowledges the tragic loss of Denice Denton. Our hearts go out to her life partner, family, and the UCSC commmunity. The LGBTQA community has truly lost a visible beacon of leadership and an advocate for the mentoring community and under-represented minorities in the the sciences and engineering fields. We are proud to have honored her as our 2006 GLBTA Educator of the Year this past February during our recognition awards ceremony at the AAAS Annual Meeting in St. Louis. Her life accomplishments were outstanding achievements in engineering and education. She was a recognized role model for all of us who showed that being out at work, including her life partner in a public manner, obtaining success in her career were not mutally exclusive parameters. Today we remember and celebrate the achievements of Denice Denton. The first female Dean of Engineering at a major research university in the United States, Denice was a pioneering leader who significantly advanced the state of research, teaching, mentoring and diversity in engineering and technology across the nation. A powerful and highly effective force for change, Denice was an inspiration and role model to countless engineers and scientists. The widespread impact that Denice achieved was accomplished through her dedicated efforts at several levels: mentoring of individuals, leading change in her own institution and local community, and serving on influential national committees. Whether working in small or large groups, her bold vision and decisive energy infused her colleagues with the courage to move forward in making the changes needed in engineering and science. While Dean, Denice co-founded the Center for Engineering, Leadership and Technology at the University of Washington, as well as a multi-institutional Center for the Advancement of Engineering Education, each involving or establishing a model followed by major research universities including Stanford, Harvard and Princeton. Denice received many awards and honors including the Presidential Young Investigator Award in Electrical Engineering from the National Science Foundation in 1986, the Presidential Award for Excellence in Science, Mathematics and Engineering Mentoring in 2004, and the National Organization of Gay and Lesbian Scientific and Technical Professionals Educator Award and the Maria Mitchell Women in Science Award in 2006, for her work in developing programs at universities and with neighboring organizations to encourage all to study in science, technology, engineering and math. She was a Fellow of the IEEE and the American Association for the Advancement of Science. She was a member of the Advisory Board for MentorNet, the E-Mentoring Network for Diversity in Engineering and Science, and a member of the Advisory Committee for the development of MentorNet’s Academic Career E-mentoring program. NOGLSTP is a national organization of gay, lesbian, bisexual, and transgender people (and their advocates) employed or interested in scientific or high technology fields. NOGLSTP’s goals include dialogue with professional organizations, disseminating information, improving our members employment and professional environment, opposing anti-queer discrimination and stereotypes, educating the queer, scientific, and general communities, and fostering inter-city contacts among our members. National Organization of Gay and Lesbian Scientists Inc. is a non-profit educational organization under IRS section 501(c)(3), and is an affiliate of the American Association for the Advancement of Science.